I’m not an alcoholic. Let me just get that out of the way before you jump to conclusions. And I know that those conclusions would be pretty easy to jump to seeing as all my Winter Warmer posts so far have featured some sort of alcoholic beverage – Frangelico Hot Chocolate, Mulled Wine, now Hot Mulled Cider. But fear not! This drink has such a small amount of alcohol that you are really drinking it for that deep, rich, sweet-like-honey taste that comes from mulling. And if you read my last two posts hoping to see a nice warming alcoholic drink to see you through winter, don’t be disappointed because you can easily alcoholify this one. Just read on! 3. 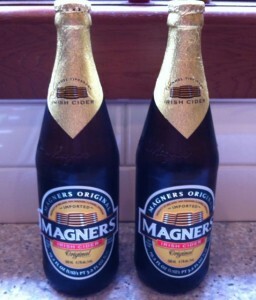 Pour in the rest of the cider or apple juice and leave to heat through at a low heat for at least 30 mins. I like to leave it for at least an hour, pretty much the longer the better. The longer you leave it, the deeper in colour your cider will be and the richer the flavour. 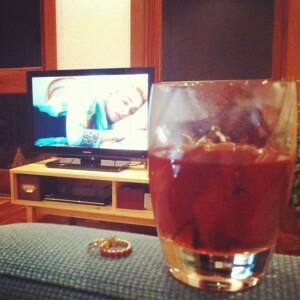 When you leave it for an hour or more, it is like drinking a little sip of heaven. I kid you not. As the cider is so low in alcohol to begin with, even with the heat turned down really low I think that most of the alcohol would have gone by the time you drink this. If you’re not convinced and you need to drive or just don’t feel like boozing it up you can just go for the sparkling apple juice to begin with. Definitely no alcohol in that! If you are going to make a night of it and want to add a little more warmth to your drink, you can add a shot of bourbon or your liqour of choice. Look at that baby. Deep, golden nectar of the gods. And if you drink it watching something amazing like Offspring, you might just slip into a coma of warmth and happiness. How easy is that? Five ingredients, three steps. The only drawback is that as a side effect of mulling your cider for longer, it does reduce the yield. Out of the 1L of cider that you begin with, you might end up with three decent sized glasses. If you want to make this for a big group of people, you will need to multiple the recipe a few times. Don’t worry, it’s totally worth it. So, my lovelies, what else are you doing to keep you warm? Its pretty damn cold at the moment! 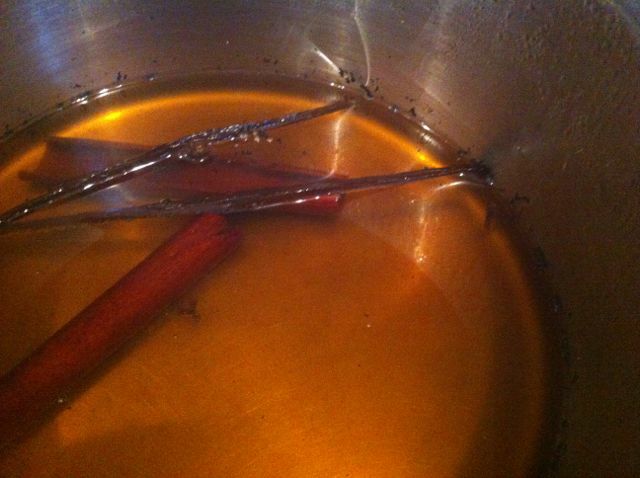 1.Place sugar, cinnamon, cloves and vanilla bean in a large saucepan. 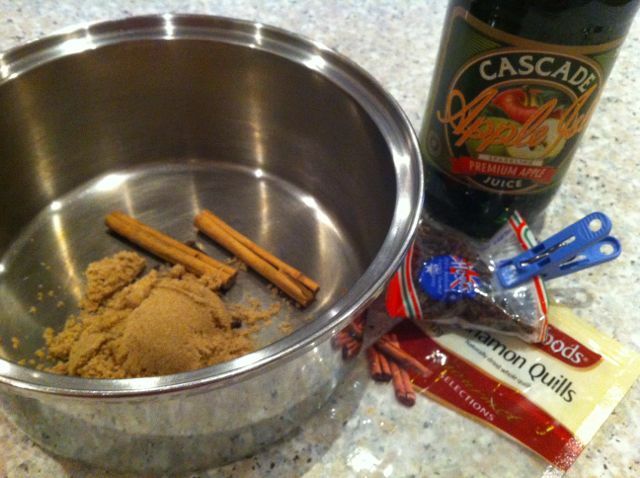 Add enough cider to cover the sugar and place over a high heat. 3. Pour in the rest of the cider/apple juice and turn the heat down to low. Leave to heat through for at least 30mins but remember – the longer you leave it, the better it will taste! ** optional, after ladling it into glasses to serve, you can add a shot of bourbon or other liquor. Go wild! 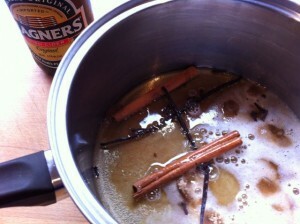 I LOVE mulled cider! I used to live in the UK and would make mulled cider with apple juice, spices and a few shots of Winter Pimm’s. I wish we could get Winter Pimms over here! Holy moly SarahKate i’ve only just discovered normal Pimms! How can I get some Winter Pimms?!?!?! This looks delicious. I’ve never had mulled cider before but I think it would be perfect for a cold night this winter. Going to give it a this weekend I think! Thanks Apple! Definitely give it a go, you won’t regret it! Enter your email below to subscribe to this blog and receive notifications of new posts.